The first Sharps rifle, a percussion design, dates back to 1848s. Shiloh Sharps makes reproductions of the 1874 cartridge design. Most are equipped with tang vernier sights graduated to compensate for the steep drop of 45-70 bullets. These rifles are usually quite accurate at long range, and the depictions in Quigley Down Under and Legends of the Fall aren’t too far off the truth. This one has a period correct scope with external adjustments. A mostly ambidextrous design, it remains a viable medium and large game rifle even today. Cartridges up to 45-120 and 50-110 (caliber – black powder charge in grains) exist, but only 45-70 is commonly loaded. This entry was posted in ammunition, rifle, weapon and tagged falling block, optics. Bookmark the permalink. 3 Responses to A very enduring design. 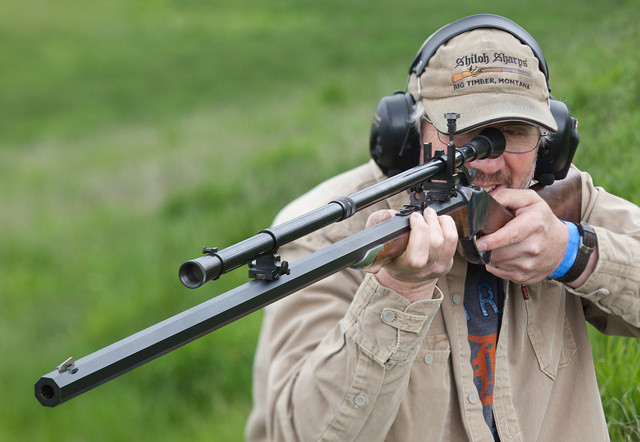 Until 1967 the 1874 sharps rifle held the record for the longest “shot to target” in history. The shot was 1720 yards made by Billy Dixon at Adobe Walls Texas in 187?. Had a chance to shoot a Chiappa Mini-Sharps; almost like you took the one above, left it out in the rain and it shrunk. This one was in .357 Magnum, and it’s serious fun to shoot.